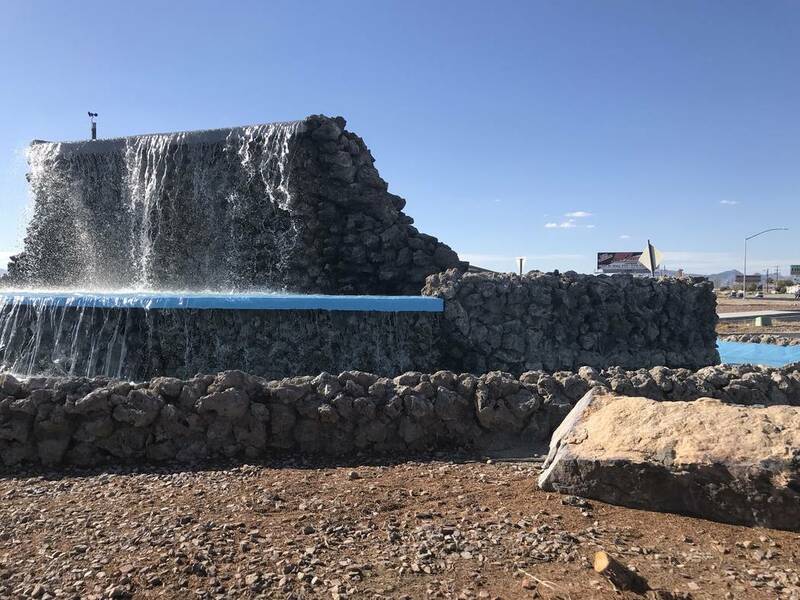 The landmark fountain at Calvada Boulevard is getting back into operation due to efforts by Nye County. Jeffrey Meehan/Pahrump Valley Times Nye County has worked to get the Calvada fountain again. Crews were working at the site on Wednesday, but was functioning on Tuesday night. Jeffrey Meehan/Pahrump Valley Times Water flows from the fountain at Calvada Boulevard and Highway 160 on Wednesday after a long absence. Nye County officials stated the project is still in the testing phase and not completed yet. 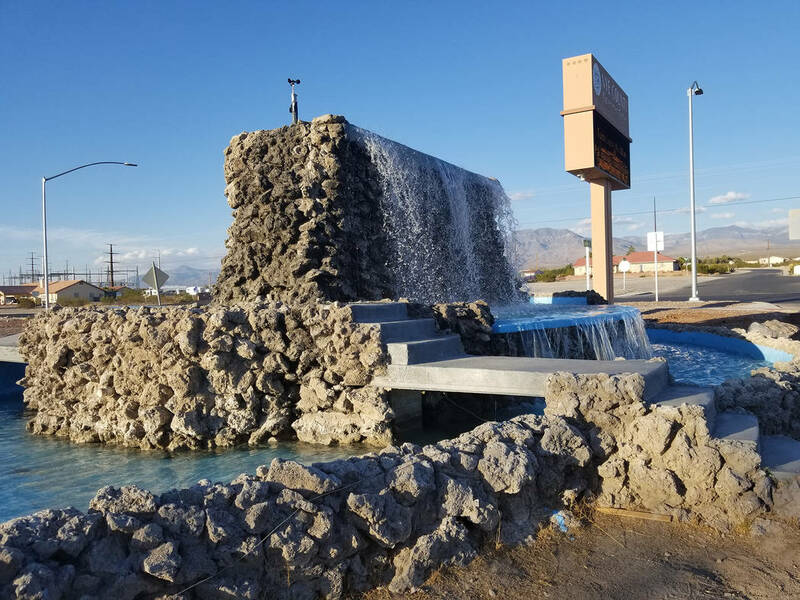 David Jacobs/Pahrump Valley Times The fountain on Calvada Boulevard and Highway 160 is flowing again after a long absence. According to Nye County, the fountain has been out of commission for nearly six years. David Jacobs/Pahrump Valley Times Water pours from the Calvada fountain on Oct. 10, 2018. Nye County crews have been working on the fountain for the past few months; the project is not completed. 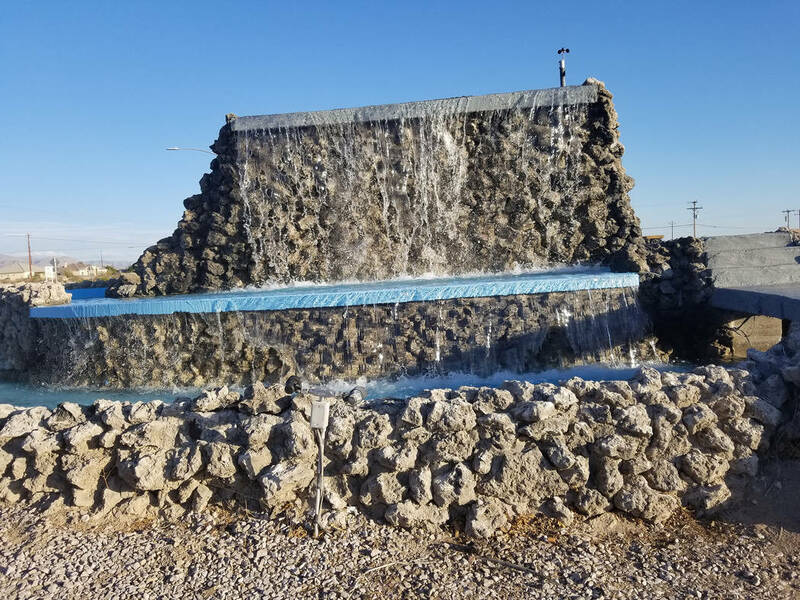 David Jacobs/Pahrump Valley Times The Calvada fountain returns after a nearly six-year absence. Nye County is still working on the fountain. Crews were on Calvada Boulevard and Highway 160 on Wednesday working at the site. Water has been flowing from the fountain periodically since Tuesday, but the project is still in the testing phase and is not yet completed. 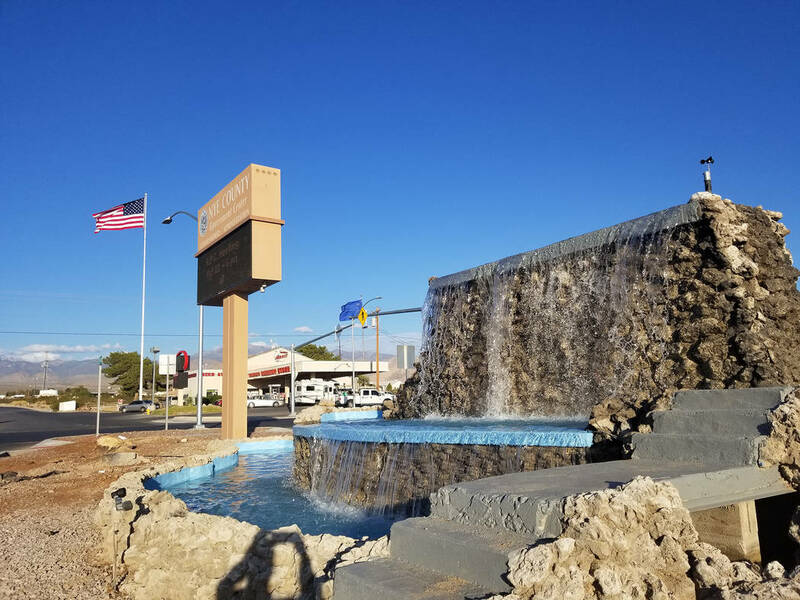 According to information from Nye County, the fountain hasn’t been functional for nearly six years, but “Nye County Buildings and Grounds has been cleaning and painting the landmark fountain during the past few months,” according to the county’s social media page. The fountain sustained damage due to an automobile crash in 2016. Valley Electric Association had given responsibility back to the county earlier in 2018. It had taken over the project in 2009, after having completed repairs that were needed at the time. 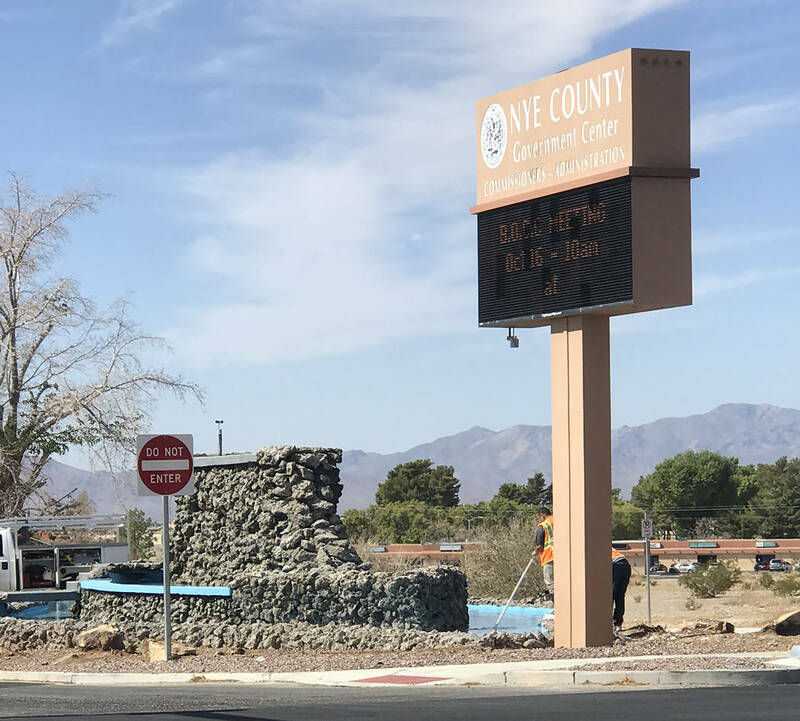 In early May, Nye County Board of Commissioners Chairman John Koenig announced that the responsibility now lies with the county during a commission meeting. People have taken to the Pahrump Valley Times’ Facebook page in response to the announcement by the county. “Sure makes coming in to town beautiful sight!” stated Tracey Resh on the publication’s social media page. Marsha Raczniak said it was “so pretty,” in her Facebook comment. Many other positive comments were given on the fountain coming back in operation. One commenter was critical of the amount of water being pumped at the fountain, stating maybe it should be slowed to save energy. Check the Pahrump Valley Times’ Facebook page to view a video of the Calvada fountain in action.